In the last post I wrote about the genesis of WTO and international trading regime. Here I essentially continue from where I left, raising issue and bringing to fore the controversies which have stalled the progressive liberalization of international trade, which has been the hallmark of this institution. It starts with agriculture (which incidentally has also been the first objective of international trade) and ranges from services to Intellectual property et. al. The seeds to these were sown in the Uruguay Round itself. The Agreement on Agriculture was the outcome of a compromise. A comprise effectuated between the North and the South wherein concessions were given by both the sides in order to conceive an international institution promoting free and fair trade. While the North agreed to open up its (1) services sector (technically known as 'Market Access') and also did up with the licensing and quota policy on (2) textiles, the South compromised on (1) Intellectual property and (2) agriculture. All WTO agreements on these four sectors, owing to the compromise, were incomplete and transitionally existent. They provided for a progressive liberalization, which would result into binding obligations for the WTO Members in a manner which was considered to be liberalization of international trade. It was agreed that the Members would generally and without being affected by prejudicing national interests (sic) think rationally and thus allow the free flow of international trade and thus permeate into effect the economic notion of competitive advantage, which predicted welfare for all. However the fallout were different. The governments of these Member states, who committed to these agreements were already under immense criticism from their national rival political parties for having bound their country in the hands of an hitherto unknown institution. Further, the developing countries had a fair cry of immediate necessity whereunder they were required to act quick in order to provide for their citizens whereas such philanthropic gesture was not forthcoming with such promptness. Then there was the NGO factor, which cried foul the entire institution as an instrument in the hands of the developed few to extract what remained in the developing. The very first cases very these developing countries were dragged to the binding dispute settlement mechanism of the WTO coincided with such allegation of abuse and violation of trust. For example see; (1) India-Patents (2) Argentina-Patents (3) Pakistan-Pharmaceuticals (4) Brazil-Aircrafts, just to name a few. This, inter alia, led to developing countries to unite and strive for the rights they were legitimately entitled to under the agreements but were denied. The developed countries continuously kept pressing for increase in market access in the developing countries (ever wondered why India and other countries are continuously raising the FDI limits in various sectors and that to at such a frequent pace?) (and also the raising standards for intellectual property rights) while they did not simultaneously dilute the barriers to agricultural imports from these developing countries, which incidentally was the only prominent tradeable commodity for them. Intense international pressure led the WTO to dedicate the Doha round (for more please read the last post) to development. However this was never felt sufficient for the members representing the developing countries had been used to lip-service and wanted some significant works now. The EC cited its own internal problems (such as the 'Common Agricultural Policy' or CAP, and the development of the internal markets) while the US argued that the developing countries had still not done enough to expect concessions. Then there was the Cairns group, which was totally opposed to the developing countries getting a strong-hold in agricultural trade. Thus arose a complicated tussle, which no one was willing to find a solution for. The Members kept postponing the deadlines, but could not arrive at any agreement, being unwilling to budge from their position and avoiding giving concessions. The issue thus lingered around. One who moved first and sought to break-the-ice, would have been considered the weaker link and would have been compelled to provide more concessions. Thus the negotiations were stalled. Thus stands the WTO today, all being unsure of its fate. Whether the institution would survive the onslaught of time and developmental needs of more than half the world population remains to be a proposition requiring the test of time. 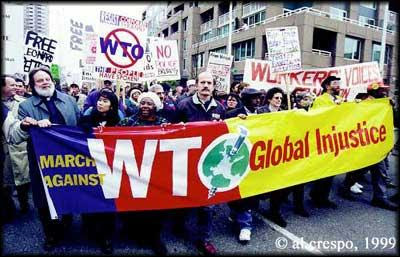 However one thing is sure; WTO being the first international institution with a binding nature of obligations, it is quiet possible, with the stalling which it has faced, that future international commitments move back to the original position and keep the international law making more of a voluntary and optional type rather than conceiving a binding institution. All this off the top of your head.. Pretty impressive. Maybe we should have a WTO at crossroads part 3 - is there a way ahead? sure, will see if i can write one on that.